Appletree Lodge in Newton-on-Derwent, near York, Yorkshire sleeps 8 people. 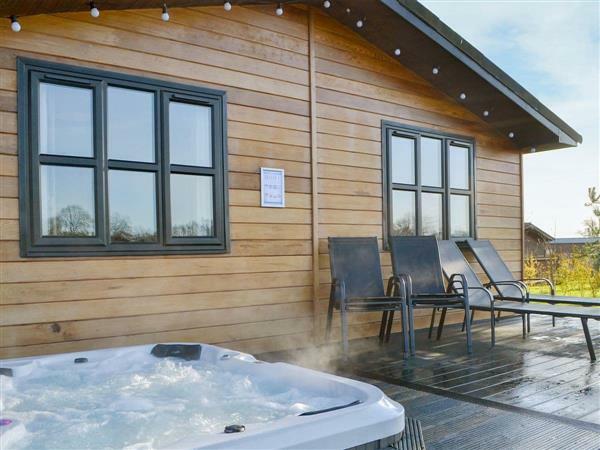 Appletree Lodge near York is peacefully located on a small lodge park; this spacious, single-storey lodge is ideal for both families and couples. 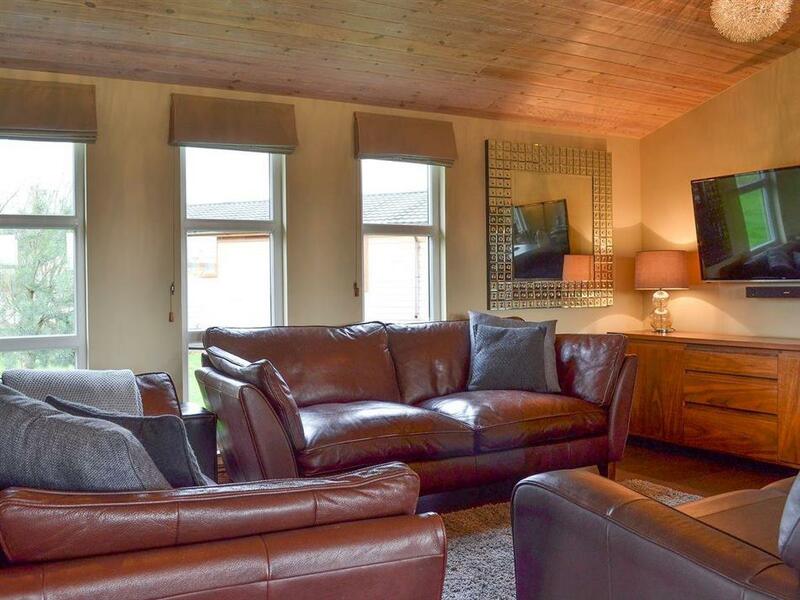 The open plan living space is bright and light, with a pool table that is provided for entertainment and a sunken hot tub on the decking, which is perfect for relaxing at the end of the day. Both double bedrooms have interconnecting doors to the twin rooms, very useful for young families but can be locked if not required. Just a short stroll leads to the small village of Sutton-on-Derwent, where a warm welcome awaits at the traditional village pub. The classic English market town of Pocklington is 4 miles away and has an array of shops and an excellent reputation for its live events and film programme. There are walking and cycling trails from the doorstep and scenic drives through the Yorkshire Wolds, which inspired the famous artist David Hockney. Close by is the Yorkshire Air Museum and Burnby Hall gardens and family fun can be found at the York Maze. There is easy access into the ancient city of York from Grimston Bar Park and Ride, 6 miles. This vibrant walled city appeals to all ages with its wealth of world-renowned attractions including the iconic Minster, the Castle and Railway Museums, the Jorvik Centre and Clifford’s Tower. Visit York’s Chocolate Story, informative and delicious! There are art galleries and theatres, quirky shops along the cobbled streets and numerous inns serving real ale. Take a trip on the open top bus, walk along the city walls and cruise along the river, or even enjoy a day at the Knavesmire Racecourse. Easily accessible are the North Yorkshire Moors and the coastal resorts of Bridlington, Filey and Scarborough. The shop is 1¼ miles, with the pub and restaurant 700 yards from Appletree Lodge near York. 3 steps to entrance. Appletree Lodge near York is all on the ground floor. Living area: With Freeview TV, Blu-ray player, Bluetooth sound bar and pool table. Bedroom 1: With king-size bed, interconnecting door to bedroom 3 and en-suite with shower cubicle and toilet. Bedroom 2: With king-size bed and interconnecting door to bedroom 4. Gas central heating, electricity, bed linen, towels and Wi-Fi included. Travel cot and highchair available on request. Decked area with garden furniture. Hot tub for 5 (private). Bike store. Private parking for 4 cars. No smoking. Holidays at Appletree Lodge run from Monday to Monday. For a better idea of where Appletree Lodge is, you can see Appletree Lodge on the map below. Appletree Lodge is in North Yorkshire; should you be on the lookout for a special offer, you can find all the special offers in North Yorkshire. It's always worth checking to see what is on offer at the moment. Do you want to holiday near Appletree Lodge (UKC1556), you can see other cottages within 25 miles of Appletree Lodge; have a look to find your perfect holiday location.